HONOLULU, Hawaii, January 25, 2011 (ENS) – Oahu beaches are normally all sparkling blue water and white sand. But on January 12 and 13, heavy rains caused extreme flooding inland at the Waimanalo Gulch Landfill, causing waste to be released and resulting in beach contamination and beach closures along the island’s southwest shore. Waste Management Inc., the contractor operating Honolulu’s only municipal landfill, today was ordered by the U.S. Environmental Protection Agency to take immediate steps to clean up the waste and contaminated stormwater and prevent future releases from the landfill. “This catastrophic failure subjected Hawaii’s residents, visitors and coastal waters to a deluge of contaminated runoff, medical waste, and other trash. Our order requires immediate cleanup, continued monitoring of the beaches, and enhanced controls for stormwater runoff,” said Jared Blumenfeld, EPA’s Regional Administrator for the Pacific Southwest. The Hawaii Department of Health has received records from Waste Management that the agency says verify that all medical waste accepted at the landfill had been properly sterilized in accordance with the law. Any medical waste that was washed into the ocean from the landfill should not be considered infectious, the agency said in a statement. Yet health dangers still exist. Water sampling results show very high bacteria levels in the stormwater and nearby coastline. “The levels of enterococcus and clostridium perfringens found in the samples are consistent with polluted runoff with storm events typically found in the ocean after heavy rains in Hawaii,” the Health Department said. The affected beaches border Oahu’s largest resort area outside Waikiki. The JW Marriot Ihilani Resort and Spa, Marriott Ko Olina Beach Club, the Ko Olina Resort and Spa, and timeshare condos overlook the beaches. At the end of 2005, construction of a new $2-million berm fronting the landfill was completed but it failed to contain the stormwater. “EPA is working closely with the Hawaii Department of Health to prevent future incidents and protect residents’ health and the environment,” Blumenfeld said today. EPA dispatched an emergency responder and two engineers to assist the Department of Health and the City and County of Honolulu with response at the landfill. The response included monitoring ocean water and any water released from the landfill, stabilization of the site, and cleanup of waste from the landfill that reached nearby beaches. The EPA Administrative Order sets a schedule with milestones to protect the environment and the public. The order requires the company to stop discharges to the ocean of stormwater currently being held at the landfill, continue daily beach inspections and cleanup, and improve the landfill’s stormwater diversion and sediment control to successfully handle runoff from rain events. Waste Management also must report immediately to EPA any event that has the potential to cause a violation of the order. Each year on Oahu, roughly 1.6 million tons of waste are generated each year. Of that, roughly 400,000 tons of waste a year are brought to the Waimanalo Gulch Landfill. 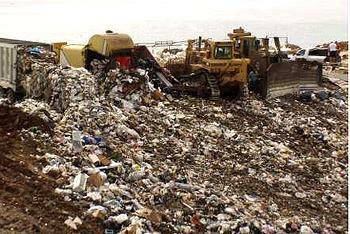 The landfill is due to close at the end of 2012. The city had wanted to keep it operating for another 15 years, but the Hawaii Land Use Commission decided in October 2009 to seek other landfill sites on Oahu.